When I started the PICU Pressure project I had hoped to end it with a bang right before The Walk. The month kind of got away from me there. I’ve got some more pieces to write though so it isn’t over yet. Donations can still be made to The Walk until december anyway so please continue to click on the link to the right and give to Hasbro Children’s Hospital. The Walk was wonderful. It was a very emotional day that really drained us all and not just because of the walking. I had hoped to do a nice write-up of the walk including pictures but that’s not going to happen right now. I will but not right now. I just don’t have the physical or emotional energy to get into it. Tomorrow morning Liam will be admitted back into Hasbro for a bronchoscopy and we’ll be there the next few days for his vent setting “tune-up”. It’s a scheduled procedure and non-invasive but because it takes place in the hospital it will wipe us all out. I’m still tired from getting up early for the TV appearance on Friday and since I also worked all weekend I am truly too exhausted to blog. 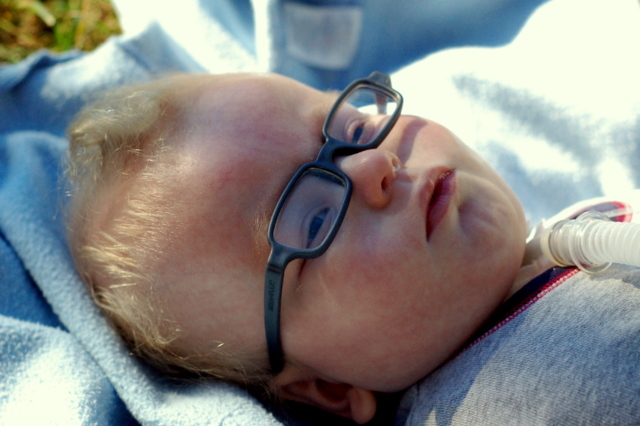 So instead of another piece about the hospital or a summary of the walk yesterday, here is a picture of Liam for you from last thursday when he went outside and lay in the grass with his mommy. I’m going to bed. ← Ready for our close-up.